Adelia Monteforte is put on a ship headed to America by her mother and father. The plan is for her aunt and uncle to provide a place for Adelia to live, far away from Italy, as life has grown to be hazardous there during war time. Moving to America, living with her aunt and uncle, learning about different ways and thoughts between Italy and America- keep Adelia’s days full, as she’s trying to get accustomed to her new surroundings. When she makes the acquaintance of her neighbors in the summer home, the Connally boys, Adelia does not know then how much life is about to change and how she will become close to all the boys- as they all begin to love her in their own way. It’s dangerous times, though, with the war happening. And while Adelia knows that war tears families apart- she’s unprepared for the other ways families are torn apart. As she sees her dreams crumble, she knows that she must find her own path. When the past comes a-knocking, can Adelia ignore it? Or, like many things in life, must the past be faced- before true healing can begin? Here’s a slight confession: After reading THE NIGHTINGALE by Kristin Hannah, I’m really very selective in my war books. Not because Kristin’s wasn’t good (it was great, it made me ugly-cry, it took SO much outta me- that I just can’t quite willingly give my heart to these authors who write about war stories because I know it’s a theme that is so emotional). So, why did I read Pam’s story? Because, I loved the cover, because the character of Adelia intrigued me- because I had hope! Was I disappointed? Did I ugly-cry? No and no! Pam’s story, while having talk of WWII, is actually more about choices. Family. Love. It was a less gritty look at what the war was doing to people (like in THE NIGHTINGALE) and more of how the war had set in motion choices and decisions for a small group of people- people that I grew to care quite a bit about during THE LAST SUMMER AT CHELSEA BEACH. 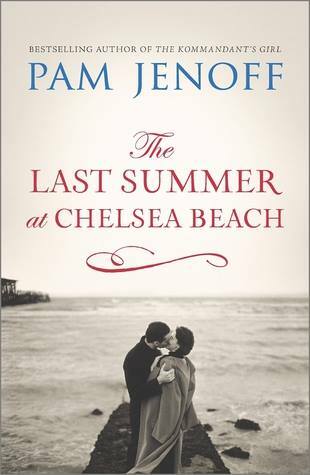 With themes of first-love, true love, finding yourself, friendship, atoning for past mistakes and ultimately forgiveness and the many forms it takes- THE LAST SUMMER AT CHELSEA BEACH is one that should be bought or borrowed quick, fast, and in a hurry! I have to pick and choose books about war for the same reasons. I appreciate your thoughts on this book and added it to my wish list! OOOH! Sounds great. Can’t hurry because I have too much in the pipeline to read in near future, but looks like I’m going to be putting this in the pipeline a little further down!